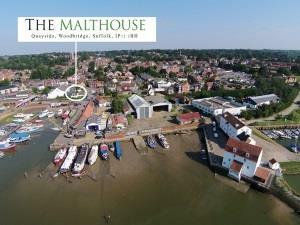 The Malthouse07584 026789work Self-cateringThe Malthouse, originally an old malting house dating from the 18th century, is located in the heart of Woodbridge town and overlooks the river Deben. To make the most of the river views, the Malthouse is an ‘upside down’ house sleeping up to 5 people and welcomes pets and children. The Malthouse, originally an old malting house dating from the 18th century, is located in the heart of Woodbridge town and overlooks the river Deben. To make the most of the river views, the Malthouse is an ‘upside down’ house sleeping up to 5 people and welcomes pets and children. Woodbridge swimming pool and gym about 150 yards away. Plenty of walks along the river and beyond from the Malthouse front door. Pubs, shops, restaurants, trains, public buses all within easy walking distance. Children welcome from age 15.